Let's raise a glass to the return of warmer weather and refreshing fruity cocktails. Whether at a Mother’s Day brunch, an outdoor dinner party or a graduation celebration, sharing a spring cocktail is a delicious way to bring people together. Here are some tips and tricks for making a party perfect cocktail. 1. Use frozen fruit in lieu of ice cubes to keep beverages from getting watered down. 2. Make homemade simple syrup to sweeten your drink. 3. Make a pitcher of your favorite drinks for large parties. They are easy to mix ahead of time and ensure that you will spend the evening socializing with your guests instead of tending bar. 4. Keep additional soda, sparkling water or juice on hand to make alcohol-free versions for adults not imbibing. 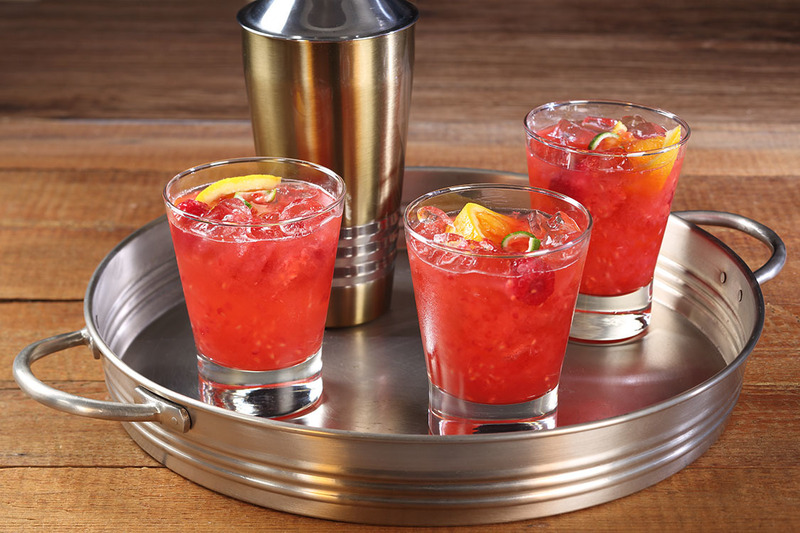 The Lemon Lime Raspberry Twist Cocktail from Nielsen-Massey Vanilla is the ideal springtime cocktail. Fragrant Tahitian Pure Vanilla Extract and Pure Lemon Extract highlight the fresh flavors of raspberries and lime juice for a drink that is as refreshing as it is beautiful. Replace the vodka with an additional ounce of lemon sparkling water for a mocktail that anyone can enjoy! In a cocktail shaker, muddle fresh raspberries, lime juice and Lemon-Vanilla Simple Syrup. Add vodka and sparkling water; shake and strain into an ice-filled rocks glass. Drop lime twist and frozen raspberries into glass. Top with a freshly squeezed orange wedge. If you are interested in making the Nielsen-Massey Lemon Lime Raspberry Twist or your own spring cocktail recipe, we can offer a 2-ounce bottle of Nielsen-Massey Tahitian Pure Vanilla Extract or a product of your choice in exchange for your review or article this spring. Please send us your mailing address and phone number for shipping. In a small saucepan, add water, sugar and lemon extract; stir to combine. Bring to a boil, then reduce heat and simmer until syrup reduces, about 10-15 minutes. Remove from heat. After syrup has cooled, add vanilla extract and stir. Refrigerate unused syrup in an airtight container. I think the first thing I will make would be tapioca pudding. I have been craving that. I will use the vanilla in cookies. Vanilla pudding to enjoy plain or as layers and filling. I will be making cheesecake! I will make vanilla pudding and later use it for cake. Would go on a baking frenzy starting with one of the many cake recipes I have pinned. I'm going to make vanilla ice cream. I would use it to make cookies and brownies.